Excerpt from Vladimir Soloviev's film 'The New World Order', March 2018. 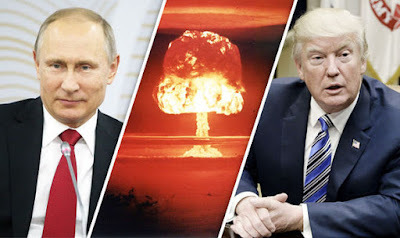 [...] Vladimir Soloviev: What about the sense of responsibility when you have the nuclear button, when the fate of millions of people, if not the whole humanity, depends on your decisions? And also when when you send our boys to distant horizons without guarantee that they will come back home alive. How do you make such decisions? How do you bear this responsibility every day? Vladimir Putin: Yes, yes, I understand. Firstly, we did not begin with this... Let me remind you that the first atomic bomb was not created by us but by the United States. This is the first point. Secondly, we never used nuclear weapons. The United Stated used them against Japan. By the way, in many Japanese textbooks, this fact is hushed up by stating that it was done by the 'Allies'. Which 'Allies'? The Soviet Union was allied with the US but no one infrormed us about it. It was not even necessary according to some experts... The U.S. did that. Where are the guarantees it will not happen again? This is the second point. Thirdly, we are not the only states with nuclear weapons. Next to the U.S., there are People's Republic of China, France, Great Britain, Russia. Five main nuclear powers. Moreover, there are nuclear powers that are not recognized by the international community. These are India, Pakistan, Israel... Therefore, we are not alone. If all of these countries have this kind of weapons then why shouldn't Russia have them? This specific topic is, of course, very important and sensitive, but I would like to tell you so that you and those abroad know our plans for its use (I hope it will never happen), but our theoretical plans of implementation are the so-called 'counter-attack launch'. What does it mean? It means that decision to use nuclear weapons can be taken only in the case when our missile attack warning system identifies not only the launch of a missile, but also shows an accurate forecast and flight trajectories and the time of falling of the warheads in the territory of the Russian Federation. This is called a 'counter attack launch'. So, if someone took the decision to destroy Russiathen we'd have a legitimate right to strike back.